Figure 3: Hand digging the peanut variety trial for collection of yield data (L to R: Callen Thompson, Ian Biggs, Teagan Alexander, and Johnny Cooper). 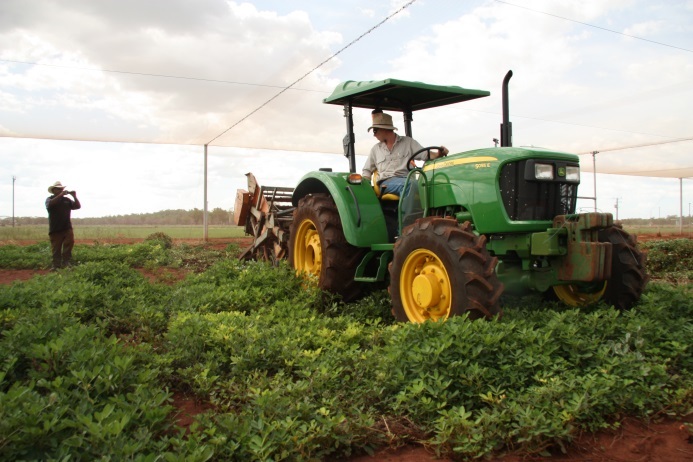 November 2015 was harvest time for peanuts at the Katherine Research Station (KRS) concluding the second year of peanut variety trials. DPIF Plant Industry Development team at KRS managed the trial in collaboration with Peanut Company of Australia (PCA). After a period away from the NT, PCA are looking to revive interest in peanut agriculture in the Top End. The trial consisted of 18 varieties including breeding lines and released varieties. Eight varieties were early maturing (approx. 100 day crop) and 10 were full season (approx. 140 day crop). The trial was planted in April 2015 but a mix of cold weather and irrigation difficulties resulted in slow crop development. This pushed the crop length out to 196 days for early maturing and 210 days for full season varieties when maturity testing indicated the crops were ready for harvest. The team are keen to understand the reasons for this slow development, when normally tropical conditions speed up crop development. Even allowing for the apparent slow growth, good yields were achieved, ranging from 4 T/ha up to 6.42 T/ha. Post-harvest analysis will reveal the quality grade for the kernels. The Plant Industry Development team at Katherine (Callen Thompson, Kae Wegman, Teagan Alexander, Johnny Cooper, Karl Bourne, Mike Kahl and Ian Biggs) conducted the hand sampling and processing of the trial. We revived some peanut harvesting and processing equipment from Douglas Daly Research Farm (DDRF) and linked this up to a new tractor for its first outing. Hand sampling at Katherine was a new experience for Callen and Ian, and boosted Callen’s resolve to trade the digging fork in for the tractor. Following on from two years of promising variety trials at KRS, 2016 will see PCA and NT DPIF undertake a larger wet season peanut trial at KRS and a commercial scale dry season peanut trial at DDRF. Figure 4: Callen puts the new tractor to work digging the remaining peanuts in the trial plot.